I have a problem on my form. My customers have different selctions to make. In example they may order a coupon (Gutschein) or benefit from a discount (Rabatt). If they want to order a coupon they may not use the discount. 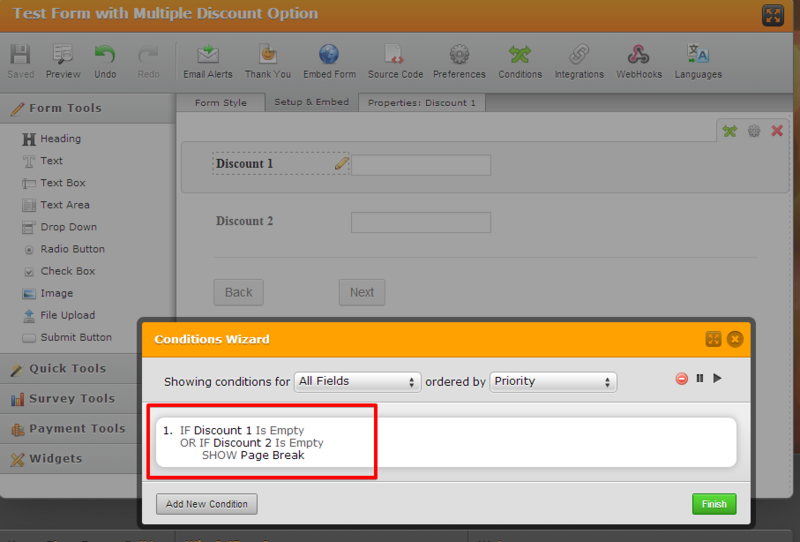 Therefore I set the condition to hide the discount field if they chose to order a coupon. This works great until someone skips this step, chooses a discount and then go back and choose to order a coupon. The calculation field (Preis) then still uses the values from the hidden discount field. How can I reset the value to the default value when the field is hidden? Or is there a workaround for this? Btw there seems to be a translation error in the german version of the conditions page. In English you may choose if "any" or "all" conditions have to be true. In German it's "Jeder" or "Alle". So I suggest to translate "any" with "Eine"
You were right on the part that hidden fields will still retain its value. Logically, this is correct, as the field was only hidden, NOT cleared/reset. Hope this help. Please inform us if you need further assistance on this. Thank you for sharing this to us. I will mentioned this to our higher team support so that it can be properly translated. Sadly this is not a help. As potential customers are able to abuse the discount possibility they will not use the reset form button. Is it possible to put it on the feature request list? I understand what you meant. And your suggested feature do have merit. I will submit a feature request ticket about it. Here is a sample form http://www.jotform.me/form/40867116124451 that have behaviour like this. On the sample form, you cannot apply both Discount, you can only use one. I 2nd this feature request. if we can get an option in the conditions to hide to enable us to hide and reset if we chose to, it would save a lot of trouble. Can this be assigned a higher priority by any chance, I am sure I have asked for this a long time ago under a different username and I remember stumbling across other threads about this too. I am sure your genius devs can do this in no time! SO JOTFORM of you Nicholas! Love the way these guys work, requests are meaningful here and my appreciation for this team and product and the way they work just cannot and will not go away!